Re-issue! Re-package! Re-release! Double-pack with photographs and extra track! REFUSED, THE (INTERNATIONAL) NOISE CONSPIRACY, AC4, THE LOST PATROL BAND, INVASIONEN... and now INVSN! Along with Sara, Kicki, Andre and Anders, Dennis Lyxzen is doing Postpunk/Wave/Independent with INVSN. Their complete 2016 to 2018 studio output is compiled here on two different coloured vinyls. Includes the album The Beautiful Stories, the EP Forever Rejected and the rare Immer Zu - Flipside "Valentine's Day". 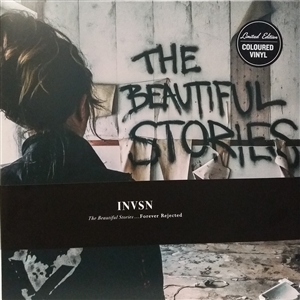 The high-quality packaging corresponds to the strongest phase of INVSN so far: double vinyl (33/45 rpm) in banderole and gatefold, exclusive touring pics plus original inner sleeves with lyrics. Limited Edition Coloured Vinyl (500, yellow/silver) featuring hits "Immer Zu", "Deconstruct Hits" and "This Constant War", the brillant b-side "Valentine's Day" as well as a cover of Lana Del Rey's "Love"!